StP St Firmin Bihen H.K.B., K.V.A D2. 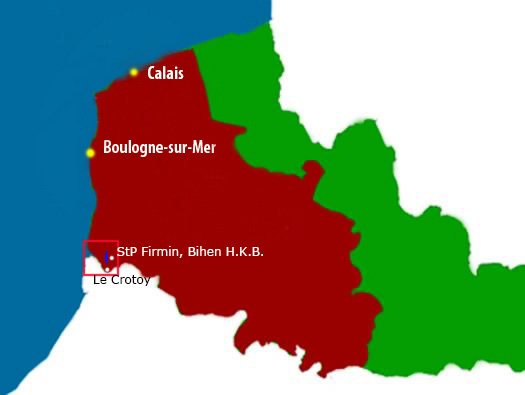 StP St Firmin Bihen H.K.B. Heers Kusten Batterie. 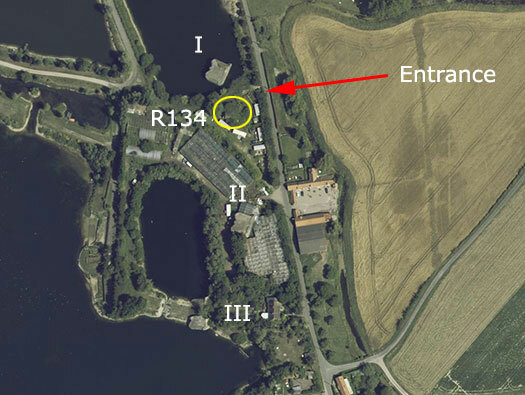 1 x R134 ammunition bunker. 1 x R600 ringstand for 5cm KwK. 2 x 5cm KwK Pak guns. 3 x 17cm K18 guns. 1 x 2cm Flak 38 Vierling. 1 x 7.5cm F.K.16 n.Art. The battery of three 17cm guns would have fired west towards the coast from St-Quentin-en-Tourmont in the north & le Hourdel in the south covering the whole of the Baie de Somme. 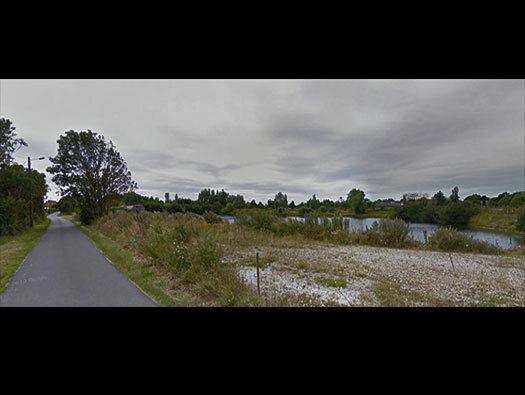 Due to gravel extraction the Turm I casemate has gradually sunk into the lake. Turm II is still on dry land and Turm III has split in half and one half is sinking into the water. A battery of three 17cm guns in R688 casemates and an area defence of two 5cm KwK Pak and a 7.5cm Field Kannon. An air defence with 1 x 2cm Flak 30 and 1 x 2cm Flak 38 Vierling [quadruple barrel]. 7.5cm. Field Kannon 19 n.Art. Like the 5cm guns this too would probably be used as an area defence gun. 5cm KwK Pak gun these must have been used as the area defence. 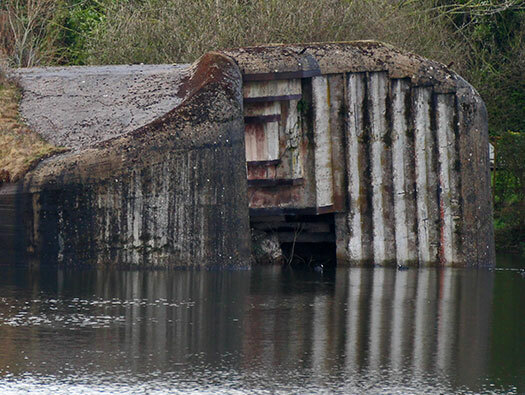 2cm Flak 38 Vierling [quadruple barrel]. .
Due to gravel extraction the casemate has gradually sunk into the lake. Turm II is still on dry land and Turm III has split in half and one half sinking into the water. 17cm K18 in an open ringstand. The roof of an R688 showing its great steel girder roof. The cap of an R688. Front view of an R688. Looking out of the embrasure. Rear entrance where a steel door would have been fitted. A simple box bunker with two rooms an a passageway entrance. Covering the rear entrance and may have been a sort of guard room.